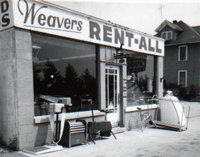 Since 1952, Weaver’s Rent-All has been setting the standard for rental equipment in Bloomington IL. Weaver’s provides construction tool rentals, home project rentals, event rentals, party goods, and more as an economical option for our customers. Founded by Charlie and Mary Weaver, the store has been family owned and operated from the start. Toni and John Petersen carried on the tradition and their sons, Charlie and Anthony, have made it a third generation business. With over 100 years of combined experience, our staff can help you find the right product for your needs. We proudly serve the entire Central Illinois area, including Normal, Champaign, Peoria, Lincoln, Decatur, and Springfield IL. So stop by our store in Bloomington, or call to find out what we can do for you!